Decorating a new apartment is always an overwhelming process since you have to consider so many things, like what decorating style to choose, what type of furniture to look for, which accessories are practical but also visually appealing. The things get even more complicated if you have kids, as you must consider resistant decorations and furniture that lacks potentially harmful sharp corners. Often, if these issues are managed incorrectly, the budget becomes the greatest enemy. It is true that an interior designer would save you many headaches but at an expensive price. Therefore, it is good to know that you can go through this stage without help as long as you manage to find a decorating style best fitting your tastes and needs. Here are the three most chosen decorating styles, suitable for new apartments. When setting up a new apartment, you need to decide with which decorating style you identify best. Are you the kind of person who fills up with energy when entering a colorful-designed room or does it feel cozier when you are surrounded by a minimalist design? Are you comfortable with the “visual” noise sent by most of the new, modern decorating trends? Or do you prefer to keep it simple, but classy, without a lot of prints and textures? These answers might give you some insights into choosing a decorating style. A style that never gets old, mostly preferred by individuals with a conservative lifestyle. This decorating approach promotes comfort and practicality. It is built mostly on symmetry, so it is a must to have the furniture grouped in formal arrangements that invite to conversation and relaxation. Square coffee tables with paired soft seats are often met in apartments following this style. These go hand in hand with a French press coffee maker and floral tapestries. Padded sofas with layered cushions can be added as another characteristic feature of this design idea. In terms of shapes used by this decorating technique, these are round or squared, flowing smoothly, romantic, emphasizing the idea of ​​comfort. The furniture is composed of solid wood pieces. Regarding the emblematic color palette, this is characterized by a range of neutral nuances combining beige, cream, maroon, white-butter, gray with deep saturated colors as accents (green, red burgundy, yellow mustard). Another key point, of this decor, is represented by the combination of wide, heavy curtains and large paintings that remind of the Victorian age. This style is characterized by the lack of effervescent colors, less visual “noise”, fewer pieces of furniture and decorations. The focus falls on practicality rather than decor. In order to reproduce the minimalist decorating, avoid overloading your apartment with accessories. In each room, choose a central decoration element that will attract attention. This item can be a crystal lamp, a rug, a coffee table or an abstract painting. The minimalist style appeared as a desire to keep the essence. To get rid of everything that is extra and assembled for the sake of extravagant interior designs. The choice of minimalist furniture is based on squared shapes and a neutral chromatic palette (as it lacks prints or textures), giving the feeling that everything is in perfect order. As a rule of thumb, this style juggles more with squared shapes, lines, materials and less with small patterns or explosive colors. 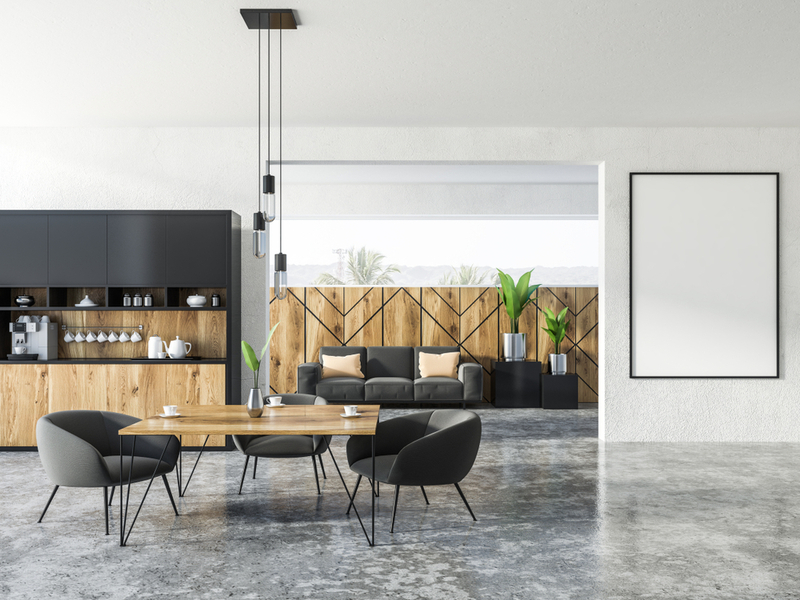 If you are thinking about setting up a minimalist style for your apartment, this goes best with wide rooms, large windows, and high ceilings, so everything seems airy. Decorating your new apartment, in a minimalist style, comes with the advantage of online shopping. Most of the minimalist furniture and decorations can be easily found online unlike the antique furniture pieces, characteristic for the Boho style, which are hardly found online and are mostly bought in time from themed stores. 3. The Boho or Bohemian Style. Boho style combines retro, hippie and rustic details. This is perfect for persons who are energized by bright-colored rooms combining patterns, textures, and contrasts with art and antique decorations. It suits nonconformist personalities, so if you are more on the conservative side, you should skip this one. This style is a combination of a bohemian atmosphere and vintage elements. The vintage elements are, usually, dark colored and “go” alongside rustic pieces. In fact, no matter how strange it sounds, the Bohemian decor is rather an anti-style based on the keyword “mix”. The Boho decorating ideas often follow a warm color palette, based on metallic tones accessorized with spots of electric and saturated colors. Nothing goes in a conventional way, therefore, feel free to mix ceramic art, gypsy patterns with retro posters and vintage furniture. However, due to its vintage air, most of the furniture and decorations are not available to be bought from conventional stores and this often leads to high prices. Therefore, if you decide to opt for the Boho style, make sure you can afford it. Do not load your home with your furniture. If you want to have a pleasant, comfortable, practical and, also, a beautiful apartment, avoid too much furniture and too many decorations. You may have noticed that the apartments decorated by professional interior designers appear extremely airy and, often, very briefly furnished. Choose a single color palette for the entire apartment. The entire apartment shall follow a single color palette combining several nuances. If each room has its own color palette the apartment will seem chaotic. The pieces of furniture shall not be in the same color as the walls since this leads to a boring, uninspired design. Opt for aesthetic but multifunctional furniture. When it comes to furnishing a new apartment, the chosen pieces shall be both aesthetic and multifunctional. This is a must when dealing with small apartments as a piece of furniture, fulfilling more than one role, can be space efficient. Measure three times, buy only once. Before starting shopping, you need to measure the spaces you want to fill. Measure also the doors’ width, elevator’s space, and the entrance into the building to see if you can bring massive pieces of furniture into your home. Furniture and accessories may look smaller in showrooms or online stores but once brought home you may dislike the way they fit into your new space. So carefully analyze your apartment before you start shopping.